This article in the Pebble Mill Magazine is from 1978. 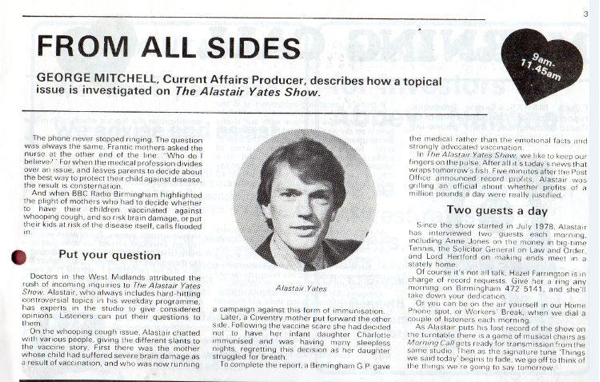 Alastair Yates presented his own show on Radio Birmingham on weekday mornings from July 1978. The show included guests as well as discussing topical issues. The article talks about how the show dealt with the Whooping Cough vaccine scare, presenting all sides of the argument: parents from children affected by Whooping Cough, or damaged by the vaccine, as well as doctors.